Star Warz is without a doubt one of the finest Drum ‘n’ Bass concepts the world has ever seen. Add to that mc’s such as SP:MC, Stamina or DRS (who’ve been hyping up the Star Warz crowd every time), a top class venue and a heavy weight soundsystem and you know what time it is ! 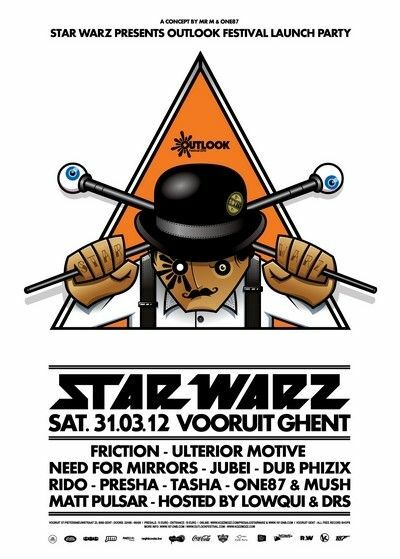 This time Star Warz teams up with Outlook Festival for their official launch party ! Outlook is Europe’s largest Drum ‘n’ Bass & Dubstep festival, held in Fort Punta Christo by the coast in Croatia. A true bass fest like Star Warz is! Get warmed up for the ’summer festival feeling’ with some of the best Drum ‘n’ Bass artists around. We start our line-up with Friction who owns Shogun Audio, a diverse, exciting, Brighton based Drum ‘n’ Bass label. Since its inception in 2004 Shogun Audio has gone on to become one of the most essential labels in dance music today. Driven by its founders Friction and K-Tee, the Shogun brand has developed in such a way that it is now an all-encompassing Drum ‘n’ Bass juggernaut releasing anything from deep and minimal sounds to dirty tech grooves and tear-out party anthems. Next up are Ulterior Motive who have set the standard high with releases on Subtitles, Metalheadz and Critical over the last year. The duo also continued to put quality first, with more releases on Subtitles and Critical plus a prestigious appearance on Reinforced and some high-profile remix work all on the way. Need for Mirrors are rapidly growing on the Drum ‘n’ bass firmament after DJ Mosus and HLZ, both acknowledged producers, decided to join forces. Since then they have released on various labels as Project 51, Foot Prints, MetalHeadz, Symmetry, Zoltar, Shogun, V Recs, Liquid V and Horizons and remixed countless big names. Jubei is another name on the lips of almost every top-flight Drum ‘n’ Bass DJ for the moment. Whether it’s his solo productions, his work as a member of Code 3 (with SP:MC and Dakuan) or collaborations with the likes of Goldie, dBridge, Breakage, Phobia, Icicle, Cern, SPY, Lenzman, Logistics and Fierce, his music features heavily in the sets of those in the know. Manchester based Drum ‘n’ Bass producer Dub Phizix began his obsession with music over 20 years ago. 10 years into his Drum ‘n’ Bass career and Dub Phizix is an accomplished producer having made music in a variety of styles for MTV, BBC, Nokia and 4Music. He also released a lot of underground tunes on high profile and respected labels such as Exit, Commercial Suicide, Soul:R, Critical, Dispatch and Ingredients with Mixmag calling his music ’Essential material’. Rido is a rapidly upcoming producer hailing from Prague. In February he released the tracks Exoplanet and Poison on the Black Sun Empire imprint called Obsessions, and that pushed him to write another track called Focus. ‘Focus’ was the first track that caught Metalheadz’ attention and after ‘The Prague Connection EP’ with his friend Hybris, Rido just finished his debut solo single for Metalheadz. Internet, radio, and nightclub DJ, event promoter, record label owner and artist mentor, Geoff Wright aka DJ Presha’s list of accomplishments within the music industry are immense. Through his Samurai Music / Samurai Red Seal record labels, his many radio shows and events companies, Presha has served as a guiding hand in the development of the New Zealand scene and has assisted heavily in establishing the International export of artists such as State of Mind, Trei, Dose, Tokyo Prose and Bulletproof amongst many others. Also London based Tasha needs no introduction. For those less familiar, her credentials include: Flight’s breaking new talent mix DJ in 2006, being booked at Fabric, Plastic People, Cable, Renegade Hardware, being resident at DJ Storm’s night Feline, playing at Sun & Bass, around Europe and even in Australia and New Zealand. This exquisite international line-up is completed with Star Warz organizer and all-time resident One87 who, for this edition, is teaming up with MC Mush from the famous Steam parties in Decadance. And as always he gives a fresh Drum ‘n’ Bass talent the chance to profile himself to a bigger audience, and this time it’s Matt Pulsar who will show you what’s he’s got. The perfect rhymes to hype you up even further will be served by two leading UK MC’s, Lowqui, resident for the Metalheadz parties and MC DRS from the Soul:R camp.